Oh, Spartans of Vigilance, I ask you to guide the leaders of the world--not the politicians, the Kings, the regents, the Chief Executives of great sovereign nations--but the parents, the true and sovereign leaders of the world of children. I ask you to guide their comments and instructions to their children about their policy regarding Terrorism, for the Nation of Family sets its foreign and domestic policies in the homes of America, China, Pakistan, England, France, Russia, Australia, Bangladesh. Such policy is formed around the dinner table instead of a polished Cabinet Meeting table, or around the news that is spoken, or heard or seen on television. The Kingdom Of The Family is the first line of defense to put the Fears of Terrorism in their proper place. What a mother or father says to his or her child or children creates the cast, the mold, that will shape a child’s opinions, beliefs, convictions far into the future. I pray, Oh Spartans of Vigilance, that the children will not hear two messages--one that is told them by their parents, and the second, that is overheard when the Guardians of Their Future think they are out of earshot. Children listen through the walls of lies. They listen for “what their parents’ really think and guide their beliefs toward that target so they can be closer to those they love the most. How easy it is for some parents to pretend Hope and Faith and Courage and Conviction in the face of a child’s innocent eyes, but when the child appears to be absent, to release personal venom, adult anger, adult hatred, adult Fear and Intimidation toward that which they just made safe in the child’s thoughts. Such conflicts cannot be hidden from a child’s sponge like mind. Children absorb Truth through osmosis, as though they were living in the marrow of the parents’ true feelings, as though they had X-ray vision of their true beliefs. What message should the children hear, Spartans? Should they hear the Truth or be given lies--softened for their tender, innocent ears? I cannot offer any parent that answer. But you can. You can guide their tongues and hearts so they deliver Truths a child can understand, and help the parents believe those truths even if all their prejudices fights against it. I ask you to help them talk about you at their children’s bedside, oh Spartans of Vigilance. Let them tell the children stories of your might and power, and how you stand above the rubble of the World Trade Center, watching and protecting them. Tell them how you believe that when people pass from this world in their earthly form, they take on other duties and responsibilities not unlike they had here on this earth. And that some are bound to the duty of protecting the children, as were those who died that day on the Second Tuesday of September. Help the parents of the Nation of Family to see in their own eyes the reason for so many “senseless deaths,” to ingrain that reason into their marrow, so when they transport the stories of the Spartans of Vigilance, they will radiate a truth the child will accept, and not wish to press his or her ear to the wall to find what “mom” or “dad” truly believe. And when those who enter your Nation of Family speak in vitriolic terms of Hate or Anger or Fear that might frighten the children into believing the Spartans are not real, or that they have abandoned them, speak up for the Spartans of Vigilance. Tell the same story to those who see only Fear and Frustration, or Hate and Revenge as their answer to the deaths of so many, to the violation of America’s innocence. 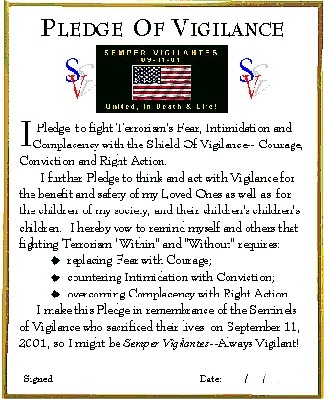 If you are so inclined, wear your Semper Vigilantes armband, or a cap with its emblem on it, or a pin. At the dinner table when thanks is given for the food, set a plate for the Spartans of Vigilance, or ask for their continued protection and vigilance so the child or children know the Spartans live by Faith, and grow in strength by conviction. Oh, Spartans of Vigilance, you who have been so vigilant as to live for nearly 2,500 years since the Battle of Thermopylae where you gave your lives for the children of the future, help the parents of the Nation of Family keep you alive in their hearts and minds, so their children and their children’s children might set a plate for you at the table, and might ask in their nightly prayers for your vigilance.